Gustav Stresemann was one of Germany's outstanding diplomats and a leading political figure of the post-World War I Weimar Republic. He championed a policy of postwar reconciliation and cooperation in Europe. Gustav Stresemann was born in Berlin on May 10, 1878, the son of a small businessman. His involvement in his family's business and the difficulties of small businesses in general influenced Stresemann to study economics and political science at the University of Berlin, from which he received a doctorate. Stresemann's first job, in a small business, carried him into the arena of liberal politics. In 1902 he founded the Association of Saxon Industrialists, serving as its director from then until 1918. Stresemann entered the Reichstag in 1907 as a deputy of the strongly nationalist, economically liberal National Liberal party. He was reelected in 1914, and his fervent nationalism and extraordinary parliamentary skill quickly earned him the chairmanship of his party in July 1917. After the end of World War I, during which he had supported the monarchy and an annexationist policy, Stresemann founded the conservative German People's party. As leader of this group, he hoped to reconcile Germany with its former enemies and to regain for his country a position of international respect. 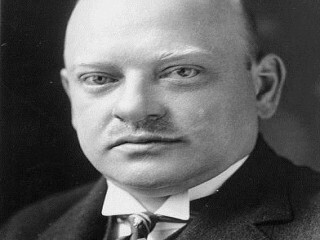 Stresemann became chancellor in 1923 at the height of the postwar inflation. His government lasted only 100 days—from Aug. 13 to Nov. 23, 1923—but it mastered the inflation and firmly established a new foreign policy of economic understanding with France over the reparations question. In 1923 Stresemann also became foreign minister, a post he held until his death. Stresemann ended the occupation by French and Belgian troops of the Ruhr in 1924. Against bitter attacks from nationalists he defended Germany's acceptance of the Treaty of Versailles as a reality and as the only realistic starting point for a successful foreign policy. In cooperation with the British ambassador Lord D'Abernon and the French foreign minister Aristide Briand, Stresemann rapidly recaptured a position of international prestige and prosperity for Germany. He then began a gradual revision of the treaty. German reparations were drastically reduced in the Dawes Plan of 1924. The Locarno Pact of 1925, which guaranteed Germany's western borders and reassured France, gained admission for Germany to the League of Nations in 1926, and it left the door open for Stresemann to pursue future border modifications in the East. The removal of Allied controls in the years following permitted Germany to regain much of its freedom as a great power, including the opportunity for clandestine rearmament. The special cooperation between Stresemann and Briand, the cornerstone of Germany's international diplomacy, earned the two statesmen the Nobel Peace Prize in 1926. However, an agreement to resolve all remaining problems between France and Germany, negotiated by the two diplomats at Thoiry in 1926, failed to survive the growing national opposition in both countries. A further reduction of the Versailles reparations, gained in the Young Plan of 1929, ranks as Stresemann's last success. He died of a stroke on Oct. 3, 1929, in Berlin. View the full website biography of Gustav Stresemann.